COLLEGE PARK, Md. - NASA today announced the end of operations for the Deep Impact spacecraft, history's most traveled deep-space comet hunter, after trying unsuccessfully for more than a month to regain contact with the spacecraft. "The impact on comet Tempel 1, the flyby of comet Hartley 2, and the remote sensing of comet Garradd have led to so many surprising results that there is a complete rethinking of our understanding of the formation of comets and of how they work. These small, icy remnants of the formation of our solar system are much more varied, both one from another and even from one part to another of a single comet, than we had ever anticipated," said University of Maryland astronomer Michael A'Hearn, who led the Deep Impact science team from the successful Deep Impact proposal to its unanticipated completion. "Deep Impact has been a principal focus of my astronomy work for more than a decade and I'm saddened by its functional loss. But, I am very proud of the many contributions to our evolving understanding of comets that it has made possible," A'Hearn said. Deep Impact first made history and world-wide headlines on July 4, 2005 when a small impactor spacecraft – a refrigerator-sized probe released from the main craft – collided spectacularly with comet Tempel 1 at 23,000 mph to give scientists their first-ever view of pristine material from inside a comet. A comet is composed of dust and ices and that form its body (nucleus) and tail (coma). The tail is created when heat from the Sun causes the body of the comet to give off dust and ice, forming a cloud that surrounds and extends out from the nucleus. According to A'Hearn the key goal of the Deep Impact's mission to Tempel 1 was to look for differences between the composition of the sun-heated surface of a comet's nucleus and its colder, more primordial interior. "Much to our surprise, and contrary to most theoretical models, the different ices [of water, carbon dioxide and carbon monoxide] that were excavated from as deep as 20 meters had the same relative abundances as the ones that were evaporating just below the surface," he said. A'Hearn noted that science results of this mission also showed comets could be surprisingly fluffy. "We found that the nucleus of Tempel 1 as a whole is at least 50 percent empty space and the surface layer at the impact site at least 75 percent empty space. This finding confirmed the correctness of some previous indirect observations suggesting comets could be more porous than expected." And he said the wide variety of craters and other surface features, and particularly the prominent layering of the nucleus found on this comet imply that the nuclei of short-period comets (those which orbit the Sun every 20 years or less) are not fragments of larger bodies as had been argued by many scientists. After the original mission was complete, the University of Maryland-led science team convinced NASA to keep the spacecraft operational and consider new mission proposals. Working with scientists from the NASA Goddard Spaceflight Center just down the road in Greenbelt, Md., they ultimately created two missions in one. The Deep Impact spacecraft and its three working instruments (two color cameras and an infrared spectrometer) headed for an extended flyby of comet Hartley 2. On the way Deep Impact's high resolution camera searched for Earth-sized planets around other stars. 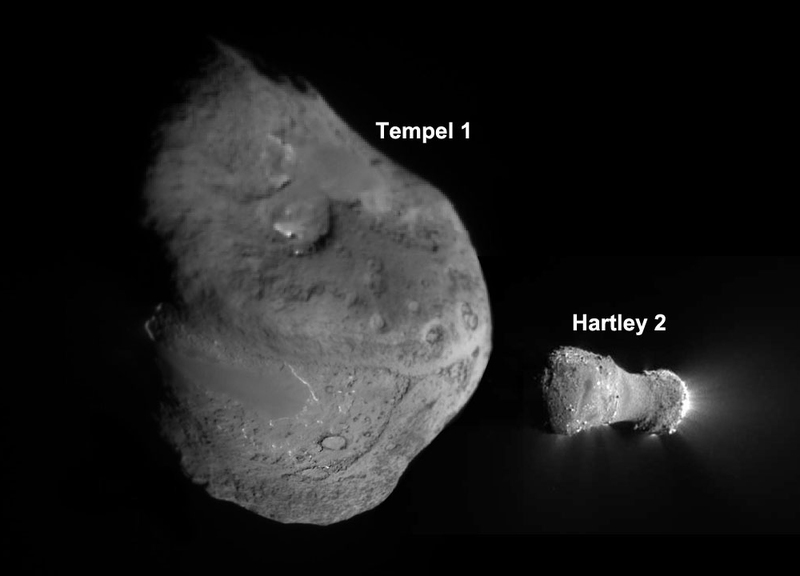 This extended mission culminated in the successful flyby of comet Hartley 2 – one of a small subset of known, hyperactive comets – on Nov. 4, 2010 during which the spacecraft flew through and imaged a "snow storm" of large and small fluffy ice particles. The team's analysis showed carbon dioxide was the volatile fuel generating the ice spewing jets that created this cosmic snow cloud. 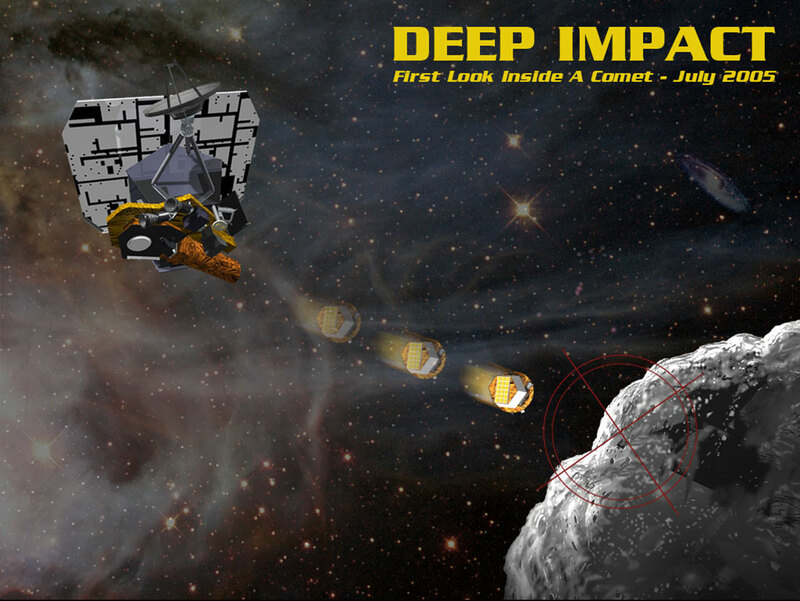 In January of 2012, the Deep Impact teams used the spacecraft's instruments for a distant campaign studying comet Garradd. After spending some 4 billion years in the Siberia of the solar system, a distant, frozen region known as the Oort Cloud, the comet was making one of its first few passages close to the sun. Observations of Garradd led Maryland and other scientists to re-examine the behavior of frozen gases in comets and the gas jets that result when these ices are warmed by the Sun. In 2013 the Deep Impact team was using the spacecraft to study another comet on its first time visitor from the Oort Cloud to the inner solar system, comet ISON. This study-from-a-distance campaign was cut short by the failure of the spacecraft. "The core of the Deep Impact mission was a controlled planetary-scale impact experiment, but in the end it was so much more," said UMD astronomer and Deep Impact mission scientist Jessica Sunshine. "Deep Impact treated us to views of beautiful landscapes including flows, cliffs, and spires that we could never have imagined, flew us through a cloud of ice surrounding Hartley 2, and along the way also confirmed that the surface of the Moon is hydrated. "The new perspective and the new series of questions raised by Deep Impact has inspired us to propose a new mission to understand the diversity of comets that Deep Impact revealed," said Sunshine, who was deputy principal investigator for the extended mission to Hartley 2. "Comet Hopper (CHopper) would be a cometary rover that would not be limited to tantalizing data from flyby comets. Instead it would explore a comet in detail, hopping from landform to landform, as the comet moves from the outer to the inner Solar System." The Deep Impact mission is part of the Discovery Program managed at NASA's Marshall Space Flight Center in Huntsville, Ala. The University of Maryland, College Park, is home to Michael A'Hearn, principal investigator for Deep Impact, and of eight other mission scientists. JPL manages the Deep Impact mission for NASA's Science Mission Directorate, Washington. The spacecraft was built for NASA by Ball Aerospace & Technologies Corp., Boulder, Colo.
Click here to see science highlights from Deep Impact.